The project aims to restore sixteen figurative vases of Attic production, which belong to the Astarita collection, all of which are exhibited in the showcases M-L. The Astarita Collection was formed in 1913 and was based on the work of a profound expert, Mario Astarita, who then dedicated it to the Vatican collections in 1967. More precisely, the artwork was dedicated to Pope Paul VI in memory of his parents Tommaso Astarita and Teresa Castellano, along with his wife Anna Ferrante of the Marchesi of Ruffano, as mentioned by the Latin epigraph posted in the room. The vases that take part in this project are signed by or attributed to various artists, covering a wide timeframe dating back to the last decades of the VI century BC and in the years from 540 to 510 BC. The majority of the beautiful artwork was created using the black figures technique. Indeed, one may find representations of mythological episodes and/or episodes pertaining to the world of the gods, as well as the use of weapons and athletic competitions. 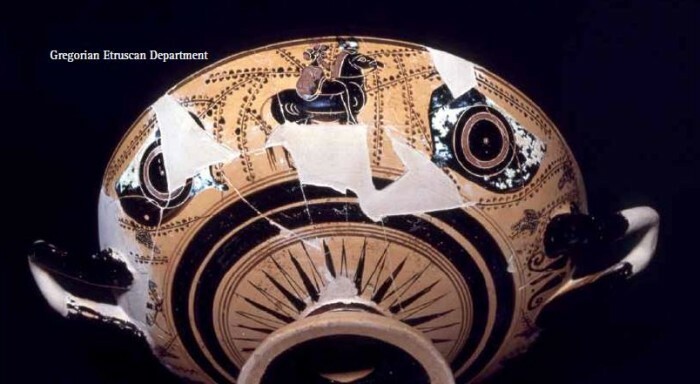 Particularly impressive pieces include, the water jar of the Priam Painter, made in the year 515 BC, as well as the downfall of Troy and the the hydia of the Antimenes Painter, made in 520 BC, depicting Eracles and the Nemean Lion along with the Scythian riders. In addition, visitors can look forward to viewing an amphore signed by the potter Nikosthenes, depicting departing warriors with dance scenes. A pyx lid with athletic scenes further completes this historic collection. Lastly, one may find an amphore of the Pioneer Group. The Pioneer Group is quite famous as this term describes artists that first used the red figures technique, and this amphore depicts a warrior riding on Dionysus’ cart. This project was pledged in March 2017. Please check back for updates. Throughout the twentieth century, the vases enjoyed various amounts of restorative changes. However, the materials used at the time for the restoration have partially deteriorated and need revising, in order to prolong their conservation status and properly display their aesthetic qualities. The new intervention will be carried out with current materials and criteria, in order to best guarantee visibility to this important section of the collection.